NOTE: Access to the waterfall is closed as of July 2018. See the note at the bottom for more information. We did a lot of research on Iceland before we left home. Months were spent browsing pictures from 500px, Flickr, Google, and a variety of other sites devoted to showing the splendor of Iceland. We highlighted pictures from Gullfoss, Seljalandsfoss, Vik, Dyrholaey, and the Snaefellsness Peninsula, taking meticulous notes on what was there and why we’d want to see it. All of this was put into a Google Map to help us figure out our itinerary. 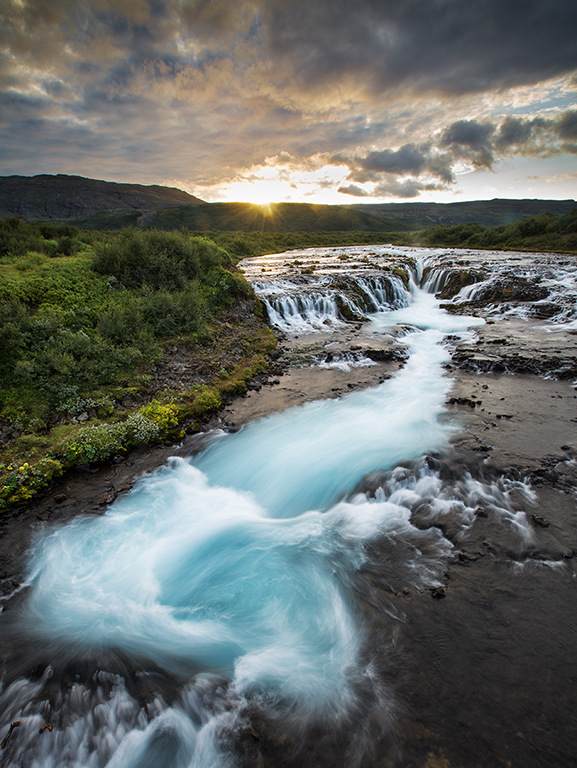 As we constructed our itinerary, one waterfall really captured my attention catapulting it to the top of my must-see list — Bruarfoss — a small but mighty waterfall in the Golden Circle area. I asked at the hotel how to get to the waterfall, but no one there had ever heard of it. The guy at the front desk did manage to find the river Bruar. 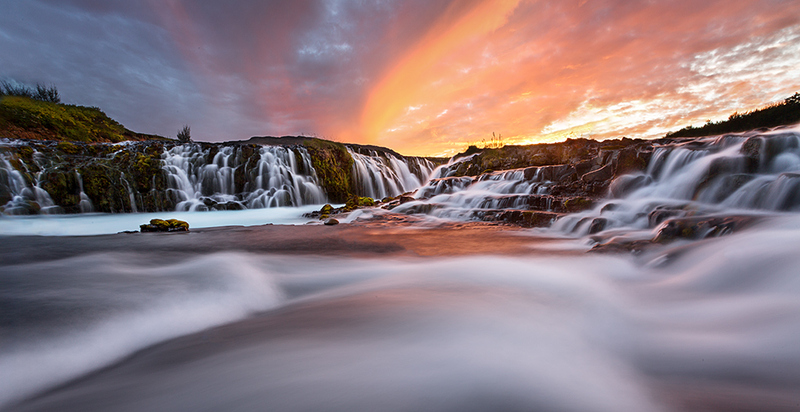 (Foss means waterfall in Icelandic, so Bruarfoss should mean the waterfall on the Bruar River.) I found general directions (with GPS coordinates) in one of Richard Bernabe’s blog posts so our afternoon scouting was supposed to be quick. We followed those directions to a tee, finding the turn and driving though the holiday park to the parking area. The notes said it was a 15 minute hike — and just remember to keep the river on your left. Off we went, down the lane, turning right and heading upstream as instructed. We hiked. We climbed over fences. The path narrowed and we hiked further, and further. After 45 minutes we were entirely sure we were not in the right place. We got back to the car and re-read the directions trying to figure out the right way. We turned into another holiday park and drove though. We even stopped and asked some Icelanders on vacation if they knew of Bruarfoss. They got a little map of the holiday park and we perused that, looking for any clues of where the waterfall might be. We drove back to the main road and tried another holiday park, curving through gravel roads until they disappeared into grassy paths. We got out and hiked a bit. We found a tiny little waterfall, and our Icelandic holiday-ers who thought we’d found the waterfall we were looking for. By this time, we’d been scouting for over two hours. The sky was blue and cloudless — not prime conditions for stellar sunset pictures. I was getting ready to give up. 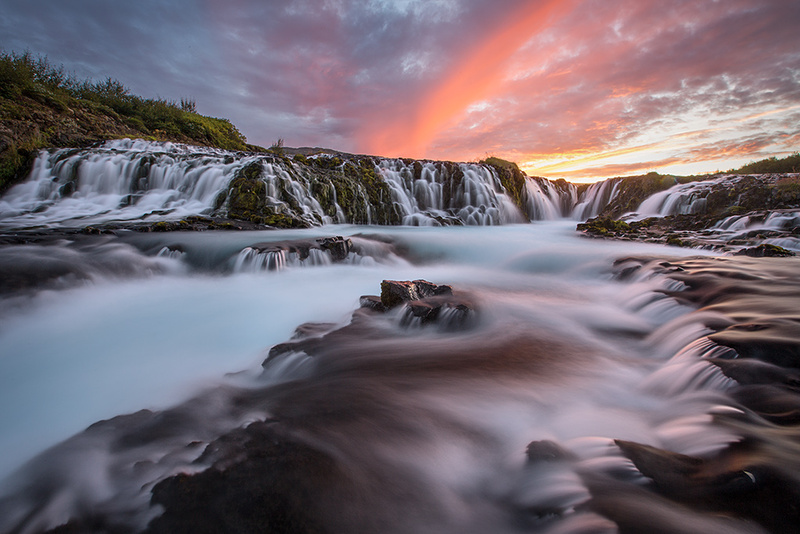 We needed a plan B for sunset if Bruarfoss was a bust. We walked back toward the car when I noticed a small sign that included the word “Bru” – meaning bridge. From the pictures I’d seen, there was a bridge over the river. As a last ditch effort, we crossed the small footbridge and hiked a bit. We gave ourselves 20 minutes of hiking before we turned around. To our surprise, we actually found it! We made a quick trip into town for sandwiches and beer since we knew we wouldn’t make it back to the hotel before they stopped serving dinner. We drove around and took pictures of horses and generally admired the landscape as well as the cloudless sky. Yes, this looked to be another bust on the sunset front. We parked the car, grabbed our gear and a few beers and headed back to the waterfall. As the sun began to dip toward the mountains to the west and the temperatures dropped, a few wisps of clouds appeared. We took a few pictures from the bridge before making our way down a steep and sloppy slope to the river. As we waited for the sun to drop, the clouds were developing nicely. For me, this was a very successful shoot. I didn’t get too committed to one spot. I moved around trying different angles and compositions. 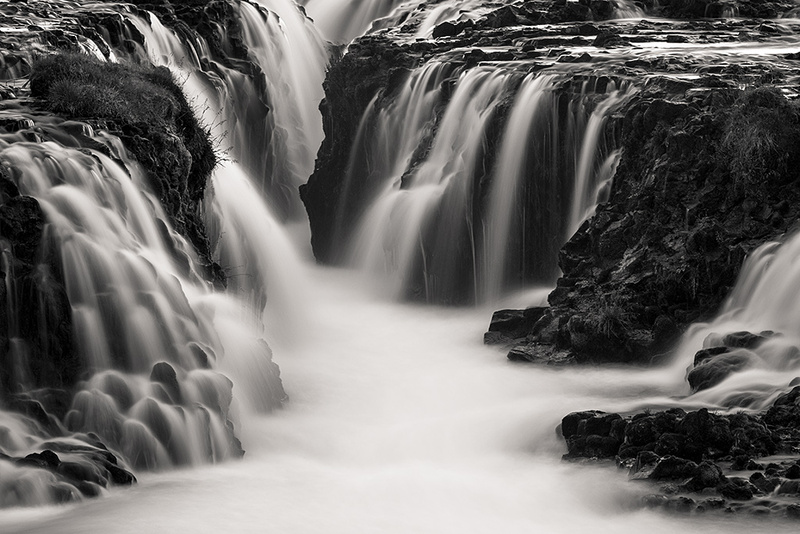 I tried my hardest to channel all my photog friends on the West Coast who shoot waterfalls regularly. View from the river. Be sure to bring waterproof boots. This water is very cold. UPDATED 20 DECEMBER 2016: Runar Gunnarsson, a local resident, tells me there is an official way to reach the falls. It looks like you park at the bridge and walk upstream on the right side of the river. The time you took and your skill resulted in amazingly beautiful photos. Congratulations. Absolutely stunning pictures. And thanks for the directions. Next time I’ll be there. Such a beautiful waterfall!!! Alternative directions: You can also park your car directly at the bridge at 37 and hike along the river (right side) – there is a path going up to Brúarfoss – and on the way you pass another beautiful even less well known waterfall called Hlaupstungafoss. .
Jens, yes, it does feel like you have to earn this one. Good suggestion about parking at the bridge. I’ve updated the post for everyone. Thanks! Sandy, you directions are out of date. The road you mention now has a locked gate. If you go to the next road, you can drive to the bridge, park and walk from there. Thanks, Jeff. I’ll update it. But I’m glad you found it. I’m sorry that I can’t be more detailed. We spent a few hours hunting for it on our first week, couldn’t find it, and then went back there on our workshop. The bridge is easy to see from a bus but not from a car. Jeff — thanks for the information. I’ve updated the blog post with your suggestions. Just went today. The two first left turns after 355 had locked gates. So, we went in at the third left turn. After probably thirty or more minutes of wandering, along the river path, we finally found it. We had to cross another bridge to get back west after the path went right, following a branch of the river south of the falls. Thanks for putting directions here! I’m going to check it out in may! Thanks for the detailed directions to the falls. I plan on visiting Iceland this Summer. Do you know how well Google Maps on your smartphone works on the island? Google Maps works very well. The great thing about Iceland is that there are very few roads, so it’s pretty hard to get lost. One note, if you want to go to the highlands you’ll need a special car and a special rental or you should hire a guide. We got a car that was rated for the back roads, but the rental agreement would be invalidated if we crossed any rivers — which is really what defines the back roads. Have fun!